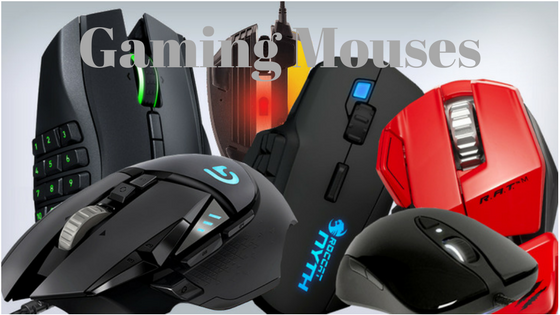 The evaluation of the Best Budget Gaming Mouse depends on the frequency, intensity, complexity, and the sophistication levels of the games you wish to play. The basic characteristics of the mouse on which you grade it, should include sensitivity (DPI), grip, LOD, polling rate, function buttons (customization), ergonomics, accuracy, shape, weight tuning, and acceleration. Of course, you could also include the other parameters that may sound relevant to you. In this review article, you can read about the top 3 mice that I have found to be recommendable. You could evaluate them by their level of friendliness and functional superiority. DPI: The wired Logitech G300S has an optical sensor with 2,500 DPI which is a good pointer speed for the gaming mouse. The importance of DPI is directly proportional to the screen resolution of your computer monitor. It helps in pointing to objects (especially the fast moving objects) with precision. For example, playing the flight shooting games could enhance the tracking and pointing of fast moving objects. But of course, it is not the only criterion for deciding on the overall efficiency of the gaming mouse. The argument that DPI has no effect on the gaming experience may come from players who are in the professional levels. However, you can certainly experience the benefits while you are a beginner. There are several games at this level. Grip: The Logitech G300S has a dimension of 4.45″ x 2.83″ x 1.57″. It gives you good fingertip and palm grip. You can move quickly and precisely while playing action packed games. You can get better control over the clicking speed and accuracy. The palm grip feature makes it possible for you to rotate and pivot your wrist at a faster pace. You can find this feature helpful while playing the car games. If you have a big hand, you may opt for the fingertip grip; otherwise you may wish to go for the traditional palm grip. Lift-Off-Distance: The lift off distance of the mouse is optimum and you have the least possibility of the cursor getting lost, when you accidentally lift the mouse from the pad. But sometimes you may experience slight movement of the cursor off the track, when the lift is less than a few millimeters. Polling Rate: The Logitech G300S has a polling rate of 1000HZ which makes it highly accurate for positioning the cursor at precise positions. It also decreases the average latency of the mouse and enhances its responsive time. Function Buttons: The Logitech G300S has 9 buttons which are ready for programming. You can reach all of them using a simple grip. They are also very comfortable to use. You can configure the mouse using the onboard options instead of having to take the log path of software specific configuration. The onboard-memory of this gaming mouse is optimum for most of your gaming requirements. The accuracy of the programming features helps you to define custom macros for every game, which work independent of each other. For this, you can easily utilize the combinational onboard and control panel settings effectively. Ergonomics Factor: The Logitech G300S has an optimum ergonomic design that reduces the stress volume on your palm and fingers while playing high intensity games. You can change the settings to left and right hand users easily, using the control panel. The shape of the ambidextrous design and shape of the mouse gives you complete comfort, regardless of the hand you use for playing the games. Accuracy: The accuracy of the Logitech G300S increases due to its low friction bottom surface. Coupled with the good palm grip, you can move the mouse smoothly over the pad, while ensuring accuracy of pointing, rotating and flipping, position shifting, shooting and other gaming options. 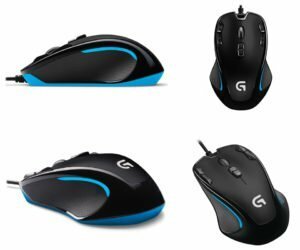 Mouse Shape: The Logitech G300S is perfectly symmetric in shape and ambidextrous. The positions for the thumb and the little finger have curvature t give you better hold for the fingertip grip and the palm grip. Acceleration: The acceleration feature of the Logitech D300S can be turned off /on with the settings. By switching the modes, you can reduce the jerky mouse movements. When you play in competitive games, you can turn on the option for playing the FPS games at a mind boggling speed. I would be happy to recommend the Logitech G300S for beginner level gamers and trainees. The number of programmer functional buttons allows you to have more macros and shortcuts during your game. You can enhance your game playing speed and focus on the accuracy. DPI: The wired optical mouse, Razor DeathAdder Elite has a DPI of 16,000. The precision value of aiming and shooting increases considerably when the mouse sensitivity reduces correspondingly. Coupled with the 5G sensor, 450IPS tracking, the mouse is also useful for increasing the speed of your gaming to great extent. The Razor DeathAdder Elite is highly suitable for playing shooting games to perfection. The sensor recognizes the slightest movements of your mouse through its image array, DSP, oscillator and the LED. The connectivity between the speed, accuracy, navigation ease, click recognition, button usage and the mouse movement direction is the key to the Elite’s success among the gaming communities. The additional feature of the sensor is its ability to vary the intense, depending on the nature of the game you play and the onscreen playing conditions. Some of the high speed games require higher level of sensing, while the others need low to moderate levels. The onboard sensor can vary its sensitivity perfectly to give you the best gaming experience. Grip: The Razor DeathAdder Elite has a dimension of 5” X 1.7” X 2.7” offers good claw and palm grips. The low profile design of the mouse, with matte finished surface makes it ideal for palm grip, while the finger grooves make it good for claw grip. The movement of the mouse on the pad becomes more precise, while the clicking accuracy increases with the claw grip. You can get easy access to the onboard functional buttons. Lift-Off-Distance: The Lift-Off-Distance of the Elite is the lowest among the three main models from the brand. According to the players’ experience whom I have interviewed so far, it is stated to be less than 1.5mm, which makes it ideal for 360-degree rotation of the mouse direction movement without having to change the cursor position from the existing location. Polling Rate: The polling rate of the Elite is 100HZ. This is similar to the Logitech G300S, which is ideal for enhanced accuracy for positioning the cursor at exact spots. You can experience the effects when while you are experiencing higher lag time while playing games. Function Buttons: The Elite has 7 programmable functional buttons. This feature is relatively lower compared to the Logitech G300S. The speed and accuracy with which you can assign the macros is reasonably good. The maximum allowed macro length is 8 characters. Besides using them for shortcuts within the game, you can also sue them to control the media according to your custom requirements. This feature is relatively beneficial when you make the customized settings for the 3-D and high definition games. The other key feature of the Elite is its programming capacity to connect the DPI. By just clicking the buttons you can switch between multiple DPI settings, without having to open up the menu. Ergonomics Factor: Popularly known as the right-handed-weapon the Elite use the smooth ergonomic features to allow you high end games with precision and speed. It is due to the soft contours which offer near zero resistance to your palm and finger movement. The other advantages for the elite users its perfect curve from the scroll-wheel to the bottom of your palm and the slip free grip you get. Accuracy: The 3.X optical sensor not only offers high value of DPI and 450IPS, it also increases the resolution to 99.4% accuracy levels. This feature is highly helpful while playing the 3-D games that require precision pointing, shooting, and other high end features. These features are similar to those offered by the hi-fi professional gaming mice for advanced gaming. So, you can easily train in specializing on the professional gaming techniques using the Elite. The precision mode of the mouse can be set to various levels, based on the screen resolution, target size, and the speed of the target movement. Some of the online games have the highest target moving speeds. They require you to move your cursor at speeds greater than their average moving speed. Failing to do so could hurt your point scoring patterns and push you out of the game. This feature can be prominently observed in the professional gaming levels. Hence, you need a budget gaming mouse which can offer the highest levels of accuracy during your practice sessions. The Elite is one of the best rated mice to offer you these features. Mouse Shape: The mouse shape is no different from the generic ones you use for office applications. So, you don’t find any difficulties while working with it. Also, it avoids all types of stress factors on your fingers and palm while playing high intensity games. Acceleration: The Elite offers a maximum acceleration value of 50G. You can experience the speed and thrilling effects of tracking and shooting the high speed objects. You can adjust the values by changing the settings according to your specific requirements. Most of the professional gamers prefer low acceleration for increased speed and accuracy. On the other hand you can find many basic and intermediate level games which need moderate levels of acceleration. By customizing the settings, the Elite offers you options to play both levels of games with precision and speed. 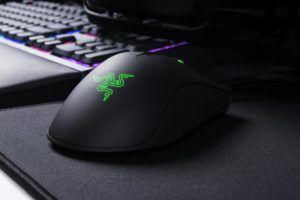 I would be glad to recommend the Razor DeathAdder Elite if you wish to play advanced level games in the FPS and MOBA games on your PC. You could also use the mouse to get fats training to move onto the professional levels. 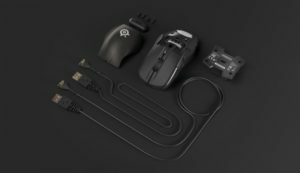 DPI: The SteelSeries Rival 700 has 16,000 Dpi, which is similar to the Razor DeathAdder Elite. The PMW-3360 sensor used in the mouse has high sensitivity for the slightest movements made by mouse on the pad. It can detect the micro meter movements and convert them into sensible actions on screen. ]Grip: The SteelSeries Rival 700 has a dimension of 2.7″ x 4.92″ x 1.65″. The overall design of the mouse makes it possible to have an easier claw and palm grip. The design may not be suitable for fingertip grip, unless your hand size is relatively larger. You can also use the Rival 700 for the best fingertip grips while playing fast moving games. Make sure you have a good rubber pad which is free from rough edges and surfaces. The gripping features of the mouse make it possible to play the game by rapidly switching between the three modes. Lift-Off Distance: The Rival 700 has a low lift-off distance, which allows you to make faster movements and rotations of the mouse without having to shift the current cursor position. Polling Rate: The polling rate of the mouse varies between 125HZ and 1000HZ. You can increase the accuracy to the level required by each gaming platform. The best way to do is by assigning the specific functional key to increase and decrease the value. By decreasing accuracy, you may make the mouse relatively faster and vice versa. The mid range of polling rate can perfectly balance the twin factors to perfection. Function Buttons: The Rival 700 has 7 programmable function buttons. The button mapping feature allows you to personalize the settings according to every game you play. It allows you long macro mapping for light setting, OLED display, software customization, and for generating alerts while playing the game. Ergonomics Factor: The curvature and the contours are more predominant on the right hand side of the mouse. On the left it is relatively straight except for a bulge behind the thumb resting position. The programming functional buttons on the left are easy to reach with this kind of grip. The ergonomic design makes it possible to possible to have smoother mouse movements and faster access to the functional buttons. The mouse seems to be designed with the predominant features for the right handed gamers. However, the left handed gamers will also find the Rival 700 to be highly useful for the combat games, by customizing a few settings in the control panel and the programmable function buttons. Accuracy: The Rival 700 has one of the best accuracy levels with its optical sensor and the DPI values. It offers you plenty of gaming techniques and training options to improve your accuracy levels. It offers FPS mouse training features for increasing the reflex actions of your fingers. You can aim and shoot much better with the twitch target practicing. The target size may vary with the nature of game. The other variable factors are the duration and the grid size on the screen. Some of the online and Xbox games also have the span time which is presented in a randomized manner. The accuracy of the mouse allows you to razor-sharpen your focus and enhance your playing ability. Acceleration: The SteelSeries Rival 700 has a maximum acceleration factor of 50G, which is similar to the Razor DeathAdder Elite. However, the hardware acceleration is stated to be zero by the manufacturers. That means you can set the acceleration settings to zero in the control panel and start using the mouse to play your games at top speed. At the same time, you can also enhance the acceleration features for those games which require them. This sort of customizable feature makes the Rival 700 ideal for game trainers for professional levels. I would gladly recommend the SteelSeries Rival 700, if you are a right hander gamer, wishing to go for the professional level gaming. Since the polling rate is variable between low and high ranges, you can use it for adjusting it according to your needs. If you happen to be a left hander gamer, you will find it difficult to use the mouse. Whether you want to use a gaming mouse and a normal mouse, there are certain things you need to know to make a perfect choice. There are differences between a gaming mouse and a standard mouse. You should not expect a gaming mouse to possess the features of a standard mouse. When you are looking for a gaming mouse, you must consider some important features to make a correct choice. A gaming mouse is supposed to be very durable. This is because it will undergo regular stress even more than a standard mouse. If it is not durable, chances are there that it might spoil easily. It should be such that it lasts longer and holds high duration. The buttons have to be sturdily constructed and the gliding mechanism ensures that you have value for your money. When making your choice, consider the type of materials used to make it. Ensure that it lasts longer. You can determine the quality by checking the warranty section of the mouse. If it does not have an extended or a long time warranty, you should not opt for the product. This is because manufacturers know they did not do quality work and because of that, you should not expect that it last longer. If on the other hands that it has an extended warranty, then it can serve you longer and you can opt for such a product. It is important that when you spend money on this kind of product that you have the real value for your money. Another thing to look out for when you are looking for a gaming mouse is the issue of comfort. You should be able to use that mouse without much challenge. It is going to offer the best level of support that you need. It is expected that it should have a firm grip in the hands when you use the mouse. The design should be such that you can customize it. If the mouse is not comfortable to use, it will be difficult to use to achieve your gaming purpose with the mouse. Because of that, consider the issue of comfort when you are making your choice. Check out their various features and compare their prices when you are making your choice. Each of these has their benefits and disadvantages. You must put all these into considerations when you are making your choice. The best thing is to look for a mouse that will help you enjoy your game. 4. How does the mouse grip? Furthermore, think of how to grip the mouse, and which grip can give you the best result. There are at least three kinds of grips and they include the palm grip, the claw grip as well as the fingertip grip and so on. This simply implies how you can hold the mouse to play your game. These are different designs, and think of the design most suitable for you and choose it. Furthermore, you should know that there are wired as well as wireless mouse. It is important that you know the differences between them and choose between the two. The choice you choose here should depend on your level and experience in using this kind of product. If you are a beginner, it is advisable to start with the wired and choose the wireless when you have advanced in your use of the product. If you start immediately with the wireless mouse, you are not going to enjoy. It is therefore important that you start with the one meant for beginners. Most importantly, you are going to consider the quality of the sensor when you are making your choice. When you talk of the sensor, it has to do with the accuracy and precision. This is aspect is very important. There are two kinds of sensors to consider when you are searching for this kind of product. It includes the laser sensor as well as the infrared or optical sensors. Many people prefer to use the optical sensors because of the sensitivity, which makes for better tracking of the game. They are good because of the LED feature. If you like, the laser sensor you can use it, but you should know that you enjoy the game best when you use the infrared sensors. When you talk about sensitivity, your mind you should go to the DPI. Extra sensitivity is important because you can achieve a better result when you do that. You can set the sensitivity to high, or to low, and it depends on the choice you want to make. In setting it at various sensitivity levels, ensure that it meets your gaming purpose. The essence of the setting is to enable you to customize it according to your gaming skill. When you are making your choice to ensure that this feature is there so that you can set it in the in a way that meets your purpose very well. Furthermore, when you are making your choice, consider the polling rates. This is another customizable feature. You must pay serious attention to that because it can help you enjoy your game. You can set or turn the polling rates in a way that can serve your purpose very well. Check for those you can bump up the polling rate so that you can achieve a better gaming result. Look for those designed with programmable buttons. This is because you are going to be on top of your game when you use it. You can program the button in a way that suits you and you can achieve a better result if you get one. The most important thing is that you will be able to play that game in the perfect and precise manner. The mouse weight is another issue you will not ignore when you are making a choice. The weight can also affect the performance of the gamer. It is not good to adopt a too large weight. This is because you will not like it. In the same way, it is not advisable to choose a too light mouse, the experience will not be good. You can always adjust the weight in a manner that suits your purpose very well. Some of them are designed with adjustable weight canister. The implication of this is that you can adjust the weight so that you have a better gaming experience. Some people might prefer a lightweight mouse while others do not prefer it. Look for a mouse you can easily adjust the weight to suit your purpose very well. Now you have all the features you are looking out for. You know that before you can get the best, you must be prepared to spend money on it. Because of that, consider the cost of the various mouse on the market and make a budget. Before you set out to shop, you must have made a budget and when you make your budget, it is advisable to stick to the budget. However, while doing that, you must not compromise quality. Ensure that you get the mouse with all the needed features. It might cost more, but you have good stories to tell because of the good experience. When you are looking for a mouse, you must consider the specifications. There are pros and cons of various mice on the market and you can make a choice after considering their specifications. Review the benefits of each of the products and analyze all the details before you can make a choice. Compare their various features. While doing that, compare the platform you use the mouse and operating system you want to use. Are you going to use it on your laptop, desktop or is it going to be on a mobile device? Check all these and choose one that can give the best result when you use it on that platform. As said before, you need to read the reviews and discover what other people have to say about the various products and make a choice. This is another important factor to consider when you are looking for a good mouse. This aspect is very important when you are engaged in one form of competition on the other. Acceleration rates refer to the time it takes the mouse to reach the rated speed. The rate reaches that speed is very important and you must put that aspect into consideration when you are making a choice. If your purpose is to use the device for gaming, then the issue of acceleration is very important. Consider you want to use a product that features acceleration or you want one that does not have that feature. Some people may choose a mouse with acceleration feature. Again, compare various products of this feature and make your choice. Some gamers can prefer to use a mouse with the light off when they play but others prefer a mouse with the light on. This brings about the issue of mouse illumination. This is another important feature to consider when you are making your choice. Lighting mechanism is another issue you cannot ignore when you make a choice. Consider whether you want a mouse with the lighting mechanism or you want one without a lighting mechanism. It only depends on why you need the light and why you do not need it. If you prefer to play in the dark, then choose the model without lighting feature. If on the other hands that you want a model with the light on, then you can look for one with lighting mechanism. If you were finding it hard to choose the best gaming mouse, the information above will assist you in making the correct choice. Many computer manufacturing companies have introduced different kinds of designs, models and gaming mouse with different features. Because of that, many gamers are finding it extremely difficult to select the new product that can serve their purpose very well. To deal with the problem, we have analyzed all the features you should expect from a good mouse. You should look out for these features. Where they are available in various models, you can compare them to make the best decision. The decision is yours and you have to relate your choice to your budget. As I have expressed in the recommendation, the Logitech scores best when it comes to the bare beginners. The main feature you will find in this mouse is the ergonomic design for left and right hander gamers. However, if you wish to go into the professional levels, the SteelSeries Rival 700 is the one I would suggest. The Razor DeathAdder Elite comes in handy, when you wish to play high end games at the beginner levels. Gaming is my passion and I occasionally research about devices to improve my gaming experience. I do have couple gaming mouse available at home and never thought there would be some advance gaming devices available in the market. I liked Razor DeathAdder. That gaming mouse seems smart, precise and look awesome. I have put that in my wishlist and will surely buy it in coming week. Let’s see how it works. Do you like any special feature in Razor DeathAdder? I like that gaming mouse as well as you but wondering if my choice is good. Please let me know if you have already bought and tested that mouse.